A clean and simple (CAS) design today. Our featured stamper over at SCS today is Rosemary. I found this card to copy and share (CASE). CASEing is simply using someone’s card for inspiration but then making your own version of it. And so, it became a Christmas card. The cardbase is a standard A2 (that’s 4.25″ x 5.5″) in Gina K’s Pure Luxury Heavy Base Weight cardstock. The Penny Black Leaping Deer image has been stamped in SU Crumb Cake. Next came the Penny Black Winter Green image stamped in SU Always Artichoke. 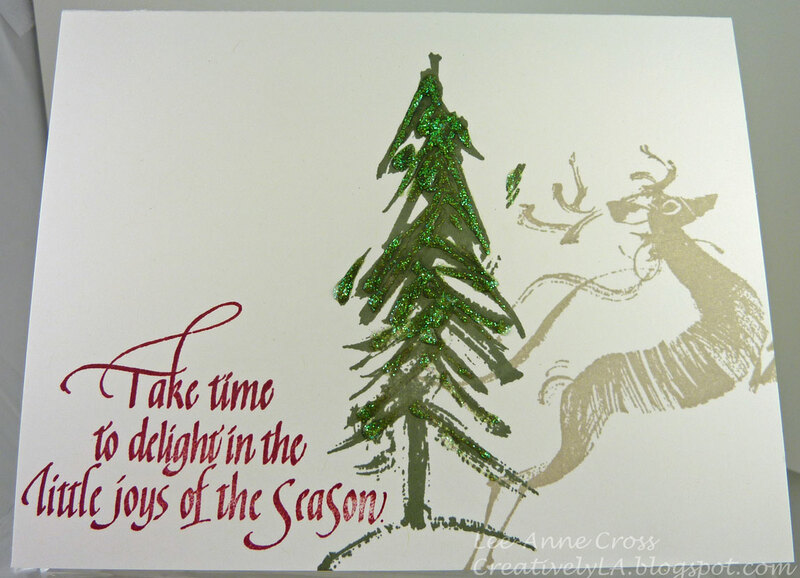 The final image is from Quietfire Designs and was stamped in SU Cherry Cobbler. And for a little bit of bling…Crystal Stickles. Here’s hoping you have a beautiful day!